Looking for a seamless way to stay on top of your schedule? 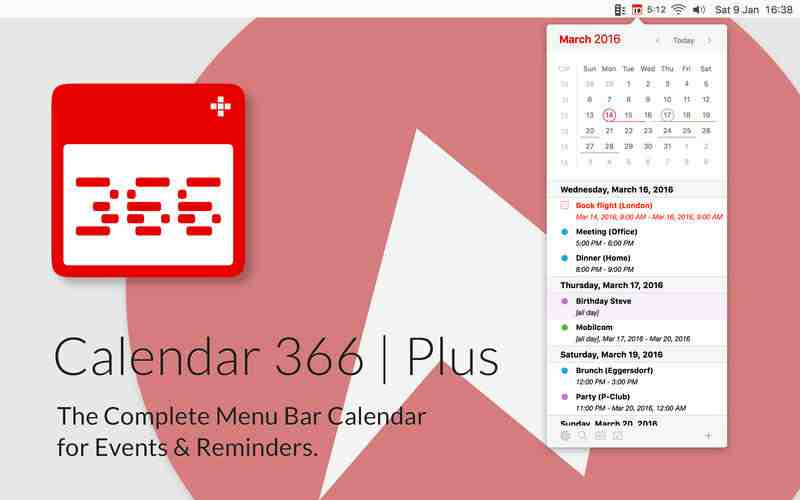 Calendar 366 Plus gives you a steady, expandable overview of your calendar, along with simple, one-click access to events and reminders. You can fine-tune your experience even further with this app's natural language capabilities. Just write an event or reminder for Calendar 366 the same way you'd scribble a note for yourself, and the app will translate "Meeting with John tomorrow 10 AM New York /work" into a customized event or reminder connected to the right date, time, address and calendar- and if you'd like to find a specific address to tie to this meeting or any other event you've planned, all you have to do is click on your destination in the map view to tell the app where it's supposed to be sending you. Calendar 366 Plus also comes with a customizable display that lets you decide which items show up on your menu bar, along with three interchangeable themes that give you different levels of color and contrast, so you can customize everything to fit your unique needs.